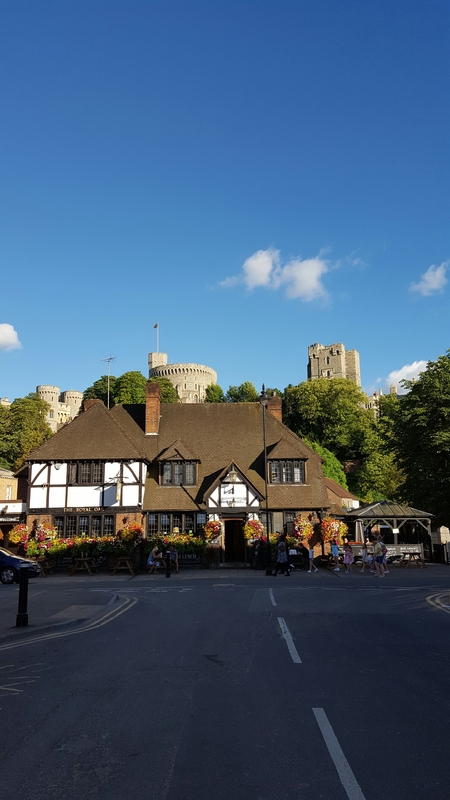 Back in early summer we had a rare free Sunday, and so in the spirit of trying to see a little more of our adopted homeland, we decided to spend a day of it visiting the rather lovely little town of Windsor. 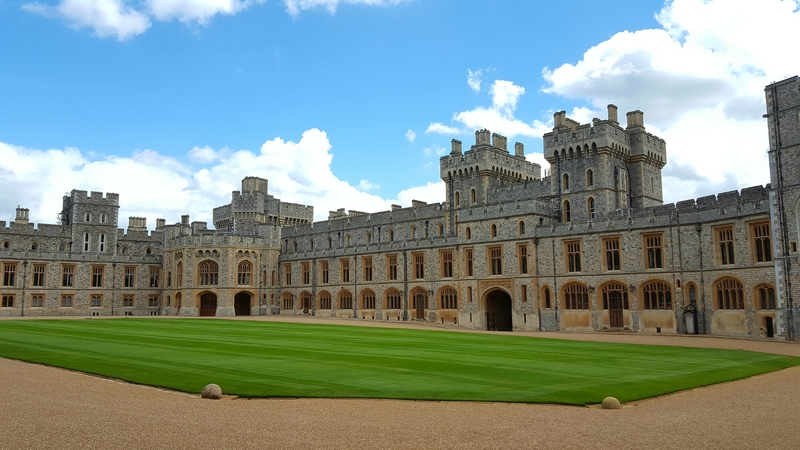 Windsor town is only a short distance from central London, and it took us just half an hour to get from Paddington to Windsor and Eton Riverside (how British are those two station names?). 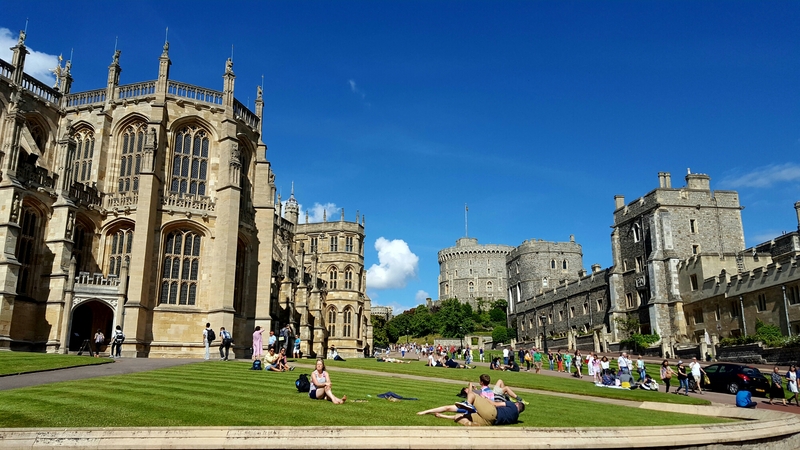 The old historic town centre of Windsor is quite a pretty little place, and where it sits on the bank of the Thames makes for an appealing location, but of course Windsor Castle is the main attraction. It is also the most obvious – as soon as you step off the train it is becomes the dominate feature in the skyline, wherever you might wander. Highest on our priority list at that point though was lunch. This meant, of course, a Sunday roast, something I’ve kind of come to love about England since moving here. We selected a nice little place on the Eton side of the Thames, called the George Inn, and after stepping over a few large dogs we found a table outside in the beer garden (inside looked very quaint, but we needed to make the most of the sunny day). All the food came surprisingly fast, and from what I remember it was very nice. There was quite a line outside the entrance when we arrived in the early afternoon, and I hate lining up for things, but I was overruled and we jumped on the back of the queue. It turned out to actually move really quickly, and what I thought was going to be a huge wait turned out to only take about 10 minutes. Tickets cost £20 each, which I thought was perhaps a little steep, though we did find that if you get your ticket stamped inside you can come back for free as many times as you’d like within a year. We almost certainly won’t go back, but it still made it seem like better value so we did it all the same. The path shortly after the entrances leads up through the middle ward, at the heart of the castle. This is also the oldest part, with the tower itself being originally based on a 12th century building (though since built upon fairly extensively), and I thought some we found some of the nicest views here. Following the path from here will lead you up towards the Upper Ward. We visited the State Apartments (very cool, though essentially nothing new if you’ve visited a few castles before), and also a surprise contender for one of my favourite parts of the castle: a dolls’ house. Not just any old one though – this was Queen Mary’s Dolls’ House, and is a beautiful replica of a huge old English country mansion built on about a 1:12 scale. Every single aspect of it is an amazingly detailed piece of craftsmanship, just on very small level – in addition to all the furniture and tiny paintings and stuff, it even has electricity and running hot and cold water. Pretty cool. After that we wandered down through the Lower Ward, and the exit. After a couple years now of exploring Europe we’ve found that two or three hours is about the maximum time our attention spans can last in most historical venues, and despite the Lower Ward also being very pretty we were unfortunately reaching the end of that timeframe. So, after one last look back up the grounds, we headed back out into the village. 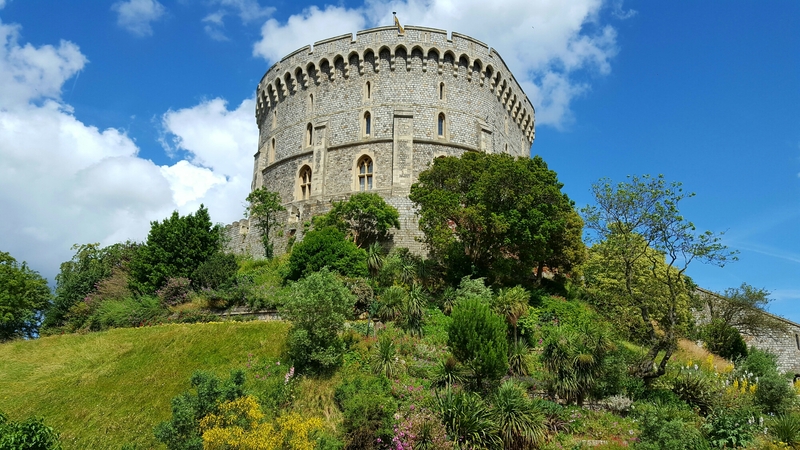 We didn’t quite have time for it on our trip, but I’d recommend you put a little aside on your visit to Windsor to check out the Long Walk. This is a path a little over 4km long, running from the Castle down south towards the Copper Horse, and it is from this path that some of the best photos (in my opinion) of the area come from. We may have to return just to see it ourselves, because it looks lovely. 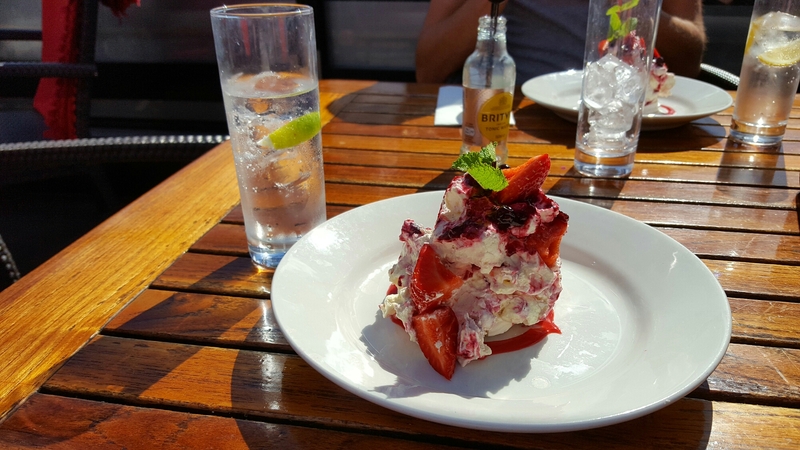 Despite missing out on that, we did manage to sample one of the other local attractions late in the afternoon – Eton mess. I’ve always been a big fan of this dessert, and so back beside the river we picked a spot (every pub sells it in Windsor – Eton is just on the other side of the Thames, like I said) and tried one out. It may have just been the sunshine, and the relaxed end to the weekend we were having, but I think this may have been one of the best I’ve had. The Boatman was the name of the place, for anyone interested. Fantastic. It was getting a little late in the day by the time we’d finished indulging, so we decided to head back to London. The station was an easy stroll around the corner, and gave us one last look back over the castle before we boarded the train. 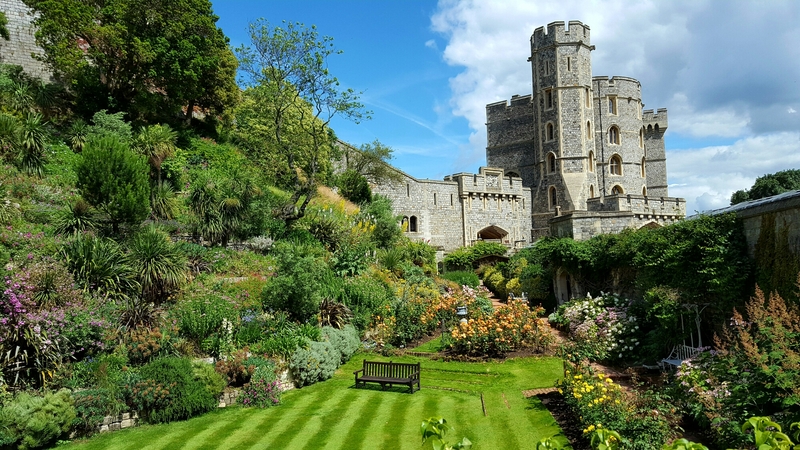 And that was it for Windsor – a great little day trip, one I’d definitely recommend for anyone based in London.